For over 10 years, Total Specialty Chemicals, Inc. has served the Polymer, Chemical, Coating and Adhesive Industries with superior products, service and support. Our commitment to quality and innovation enables us to offer a wide array of technologies producing dispersions, emulsions and processing finely powdered chemicals, proprietary materials and formulations tailored to your specifications.. Photographic, Water and Metal Treatment, Pharmaceutical, Personal Care, Food and Fragrance. 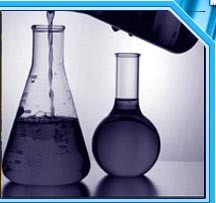 Services include Custom Manufacturing, Formulation, Liquid Blending, Drying, and Distillation. Total Specialty Chemicals, Inc. (TSC) is a leading manufacturer of specialty chemicals, flame-retardants, stabilizers and resins. TSC offers contract manufacturing of specialty chemicals; micronizing, micro-pulverizing, classification and blending services for pharmaceutical, food and selected industries. Our plants are registered with FDA & EPA & complies with cGMP. Plastic additives for PVC heat stabilization and lubrication, antioxidants, plastic lubricants, and other unique specialty catalyst products.